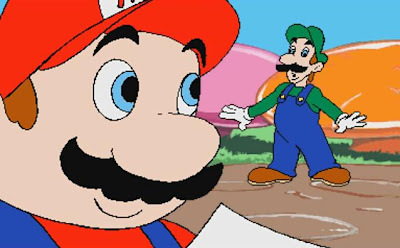 With the program we told you about last tuesday our 'decoding team' has created high definition versions of some original Hotel Mario cutscenes! That's a cool homebrew project for CD-i which has big potential for me! What better can we preserve for the future than these original high resolution versions! Even more special is the before unseen cutscene we posted a shot about, which have been reproduced now as the original never-used cutscene as well! I'd love to see this happening to other CD-i games too. Luigiblood: "I have tried this on Zelda CDi, and FlashBack, for the Zelda CDi, it's working, but the audio data just cuts the Image Data like Hotel Mario, and FlashBack, somehow, i can't say it's working, but i can see some frames in garbage of colors." opt_fr_ adds: "It's tedious to reproduce these cartoons because sometimes it's hard to determine where, when and what frame is stored in the file. Every time you solve a problem another one comes out. Instead of making the pattern matcher (that finds the images) more complex I'll try to find these data by block, to avoid being surprised when audio come at the middle of the frame." - We can imagine the hard work this must take, but the result is great! Find below the unseen and unused cutscene found in Hotel Mario!